Telecommuting is becoming a necessity in today's culture. Not only because gas prices are rising and it's extremely hard to carpool but because no one wants to be stuf in a beige world for 8+ hours a day. I found this article about a woman who decorates home offices, you can read the article HERE, I thought it was interesting because she is helping change the way people function in society. Until a meteor knocks a satellite out of orbit we are going to continue to fight for our freedom from this 9-5 life people created during the 50's. For me working at home relieves so much stress. It allows me to be in an environment that I can make noise in, make a mess in, and not feel limited by four walls. It also allows me to actually get more accomplished. Think about how much time you waste sitting on the freeway because everyone has to be at work at 9 or everyone is allowed to leave their cube at 5. Why does everyone in the world have to be on the same schedule? It makes absolutely no sense. One of my biggest pet peeves is when you do work from home, the assholes who need to be confined to an office think you aren't doing anything. When in fact it is the complete opposite. Also, why do people prefer to sit under florescent lighting all day when there is this big bright burning star in the sky for 12 hours a day that actually provides nutrients to help your body thrive. Again, I don't get it. Working from home offers flexibility with children. I don't have any, but think about how many latch key kids there are. Working from home allows you to manage your work so you can pick up your children and be part of their lives. No one ever wished they could work more on their death bed. Work all day in your sweatpants - This goes back to being comfortable. I see the account side dressed all fancy everyday and they just email clients and talk to them on the phone. You can't tell me they wouldn't be able to do the same thing at home in their sweats. Ability to work outside - Going back to the big burning star in the sky. It is good for you. Go get some Vitamin D to help build up your immunity. There are webcams on every laptop allowing for video conferences - Hello skype or ichat or any other program that let's you see people you are talking to. It's just like being in the room with them, without actually having to be in the same room with them. Also, think about all the money you will save on pants. Ability to pick the type of desk chair you want to sit in all day - Or not sit in all day. Sometimes I work at the kitchen counter and stand. It's important to be in an environment that you feel comfortable and safe. There is always someone at any job that just won't allow you to get thing done. Being at home you can at least limit their interference in your daily life. Home cooked lunches - Think about how much healthier our country could be if people actually made food for themselves instead of trying to shove fast food down their throats just to make it back to the office in the thirty minutes they are allotted to relax and get food. Companies save money on utilities - People leave lights on, they waste paper, they waste coffee. By allowing them to work from home, I guarantee they will waste less of everything. Save gas - This is another hippie reason but truly it's good for the environment. I travel 50 miles to and from work on a daily basis. Instead of traveling south to downtown, I would rather travel north 10 miles and be at the lake. You have to make space in your home for an office - It might take a little while to figure out where you do actually work best to get things accomplished. This is one of those things that is like a con but is really a pro because it will force you to venture out and try new things. Work surrounds you all the time, making it harder to create a work/life balance - This is something a lot of people do not know how to do. You need to make sure when you aren't accomplishing anything in front of the screen you go do something else for a bit. Hiring people who can't handle the freedom - Again, you need a special type of person who knows how to handle the freedom. As much freedom as it is it is also a lot of responsibility. There are definitely adjustments that people/companies have to make when deciding to allow telecommuting. It could be as easy as every Monday people can telecommute. No one likes Mondays anyway. Or allow people to pick their days, rotate switch things around. Contrary to popular belief change is good people. Do you know of some other pros and cons of the telecommuting world? 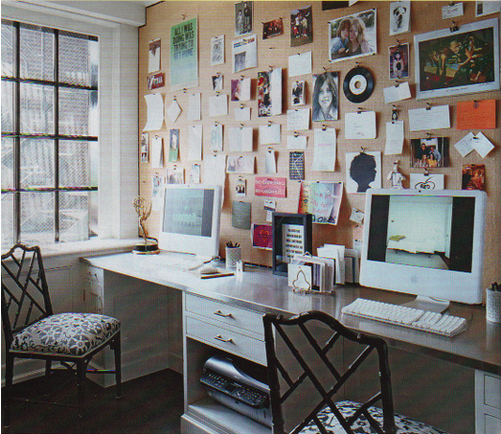 Or do you have your own home office? Leave me a comment or photo!